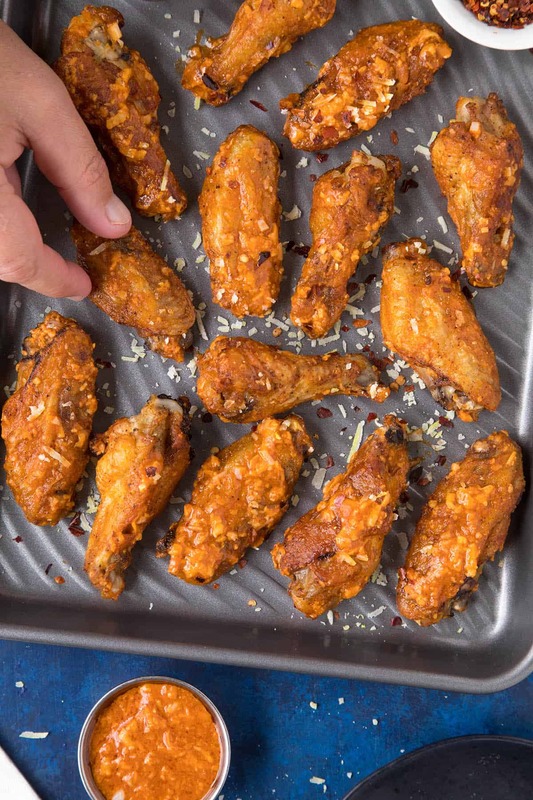 A recipe for crispy baked chicken wings tossed with a homemade garlic-parmesan sauce that you can make in minutes. It’s always time for chicken wings. I couldn’t tell you when it was that I got hooked on chicken wings. I had never really tried them until late into my college life. The only exposure I had to chicken wings was from the buckets of chicken my mother used to pick up every now and then, but there were only 2 wings in the bucket and my mother took those first. Fast forward and I am an admitted wing junkie. I LOVE heading out to one of several wing joints in my area, mixing and matching different sauces, going crazy hot one day, sticky and sweet the next. So many wonderful choices. 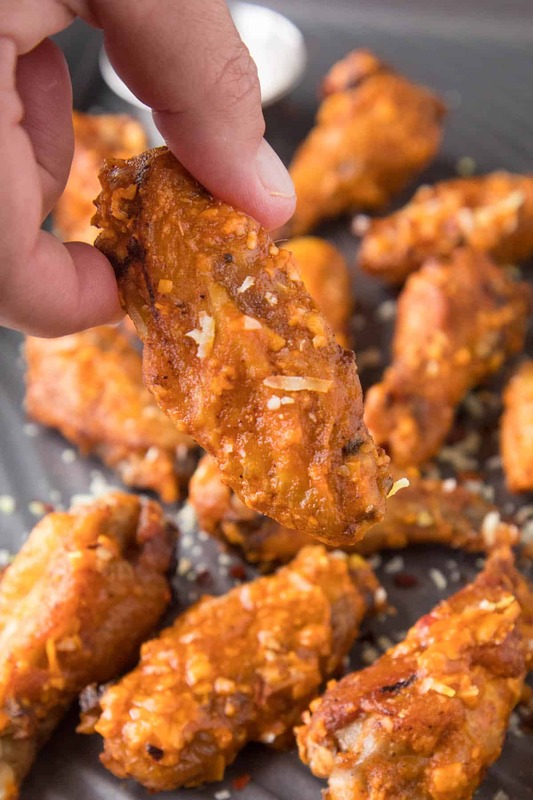 That said, wing joint wings are wonderful and all, but sometimes you just can’t beat a batch of chicken wings made at home, especially one of the most common, and most popular preparations because of the awesome flavor: Garlic-Parmesan Chicken Wings. I’ve made chicken wings many, many different ways and this is one of the simplest ways to prepare them. I’ve opted to bake them, which is what I usually like to do at home, rather than frying, which can be quite messy with wings. 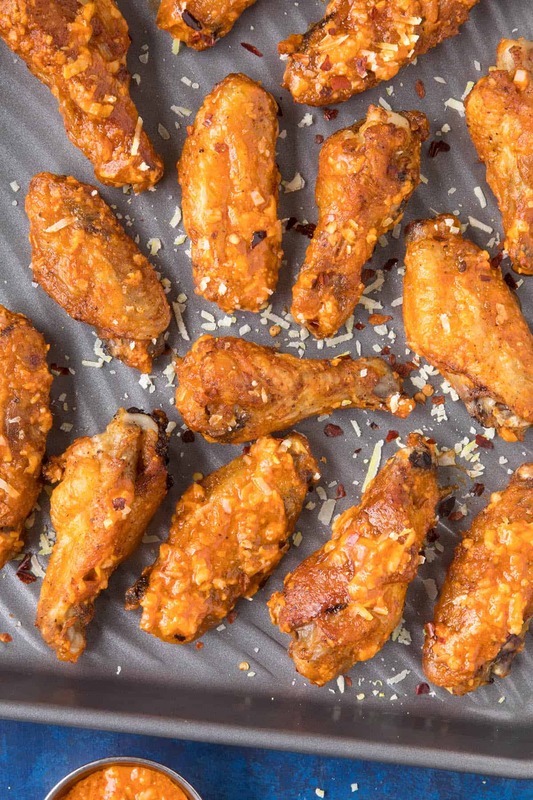 If you have a fryer, go for it, but baked wings are fall-off-the-bone. Trim the wing tips from the wings and separate them. Rub them down with baking powder, garlic, chili powder, dried basil and salt and pepper. The baking powder helps draw the moisture out, allowing the skin to crisp up nicely. 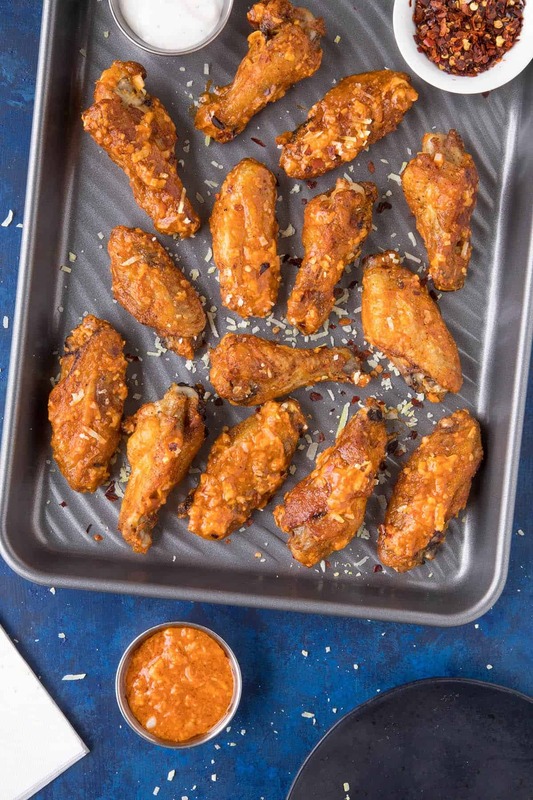 Bake the wings for 30 minutes at 250 degrees, then crank up the heat to 425 degrees and bake another 30 minutes, or until the wings are cooked through. While the wings are baking, whip up your sauce. It only takes a few minutes, so get it going close to the end of the wings cooking time. Here are your sauce ingredients. Melt butter in a pan and add the garlic. Cook a minute, until fragrant. The smell of garlic cooking slowly in butter will drive you wild. Add in the hot sauce and heat through, then swirl in the Parmesan cheese and remove from heat. If you add too much Parmesan it may get a slight bit gloopy, but the flavor is still there, and that gloopiness will disappear when you toss it with the wings. Sprinkle with a bit more Parmesan cheese and there you go. 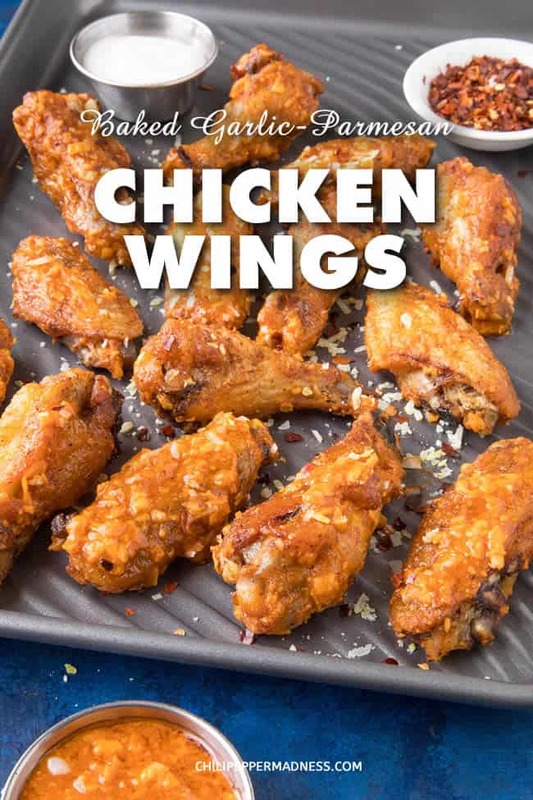 It’s a simple and classic chicken wings recipe, a reliable old standby, but there is a reason it is a go-to for so many. The resulting chicken wings are tasty as heck! 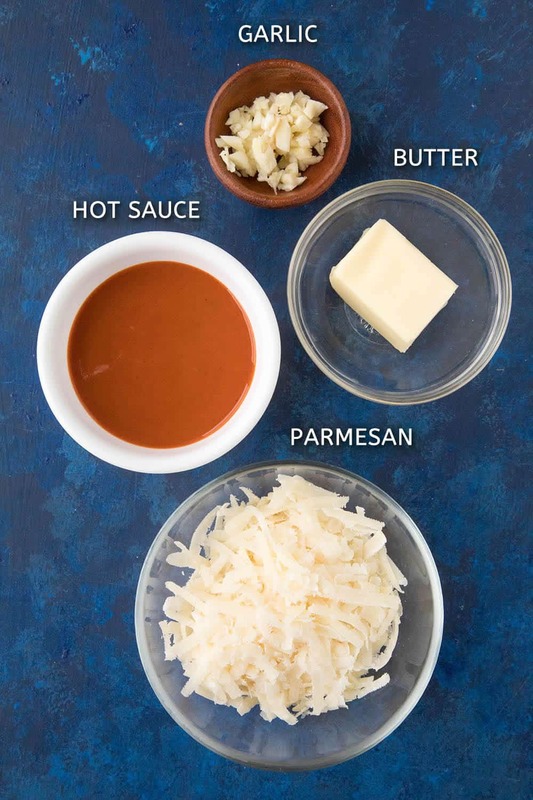 Every bit delivers a combination of mellowed garlic, sharp cheese and a saucy tang. Can’t get enough. Maybe you should make a double batch. 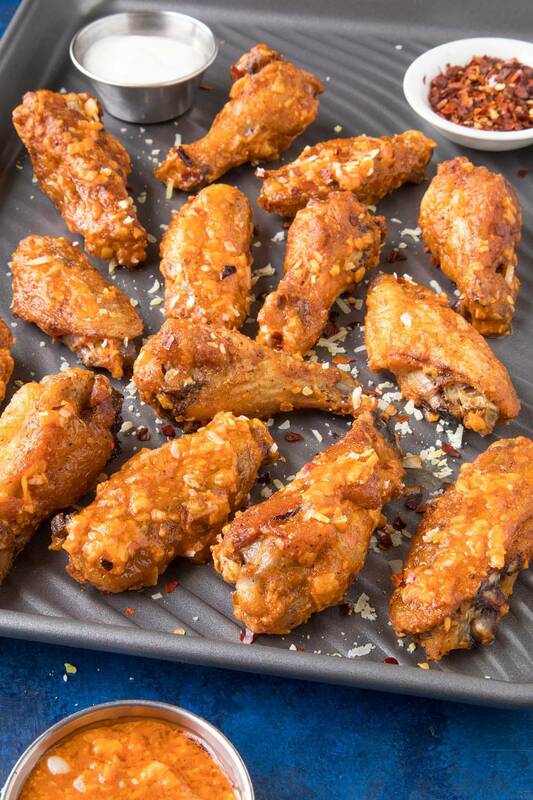 Why ever go out for wings when you can have these beautiful, baked wings to your exact tastes? Bring on the Parm! I always want more Parm. 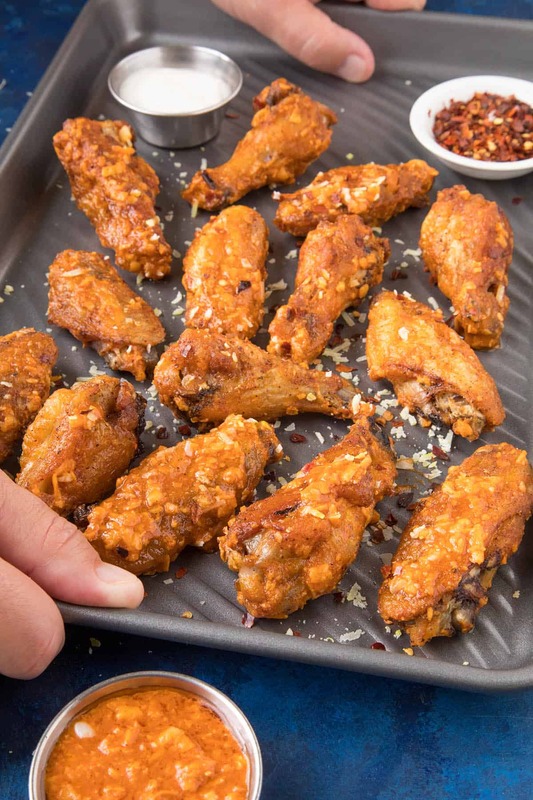 A recipe for crispy baked chicken wings tossed with a homemade garlic-parmesan sauce that you can make in minutes. It's always time for chicken wings. Set the wings into a large bowl and season with baking powder, garlic powder, chili powder, basil, and salt and pepper. Toss to get them nice and coated. The baking powder helps with the crispiness. Increase oven heat to 425 degrees and bake another 30 minutes, or until the wings are cooked through and the skins are nice and crispy. For the sauce, add the butter to a small pan and heat to low. Melt the butter and aadd garlic. Cook a minute or so, then add hot sauce and Parmesan cheese. Swirl and heat to combine. Remove from heat and toss with the wings. If you're looking for HEAT, add in extra hot sauce, or sub in a hot sauce to your liking. A good spicy chili powder blend or chili flakes are also very welcome here. This recipe was updated on 11/6/18 to include new photos and information. The original recipe was posted on 11/11/16. Great, Halima! Super happy you loved it! You’re very welcome. Haha, yes! Better to share with your hubby! Glad you enjoyed them. Thank you for these wings.they are easy and since my husband’s heart attack we have had to make diet changes. Thank you for this tastey choice. Thanks, Patricia. I’m glad you enjoyed them.